Baritone Elijah Blaisdell performs with ensembles across the country as both a soloist and a chorister. An early and new music specialist, his most recent credits include performing as an Adams Fellow with The Carmel Bach Festival, featured soloist with Grammy-Nominated Ensemble The Crossing, St. Matthew Passion with Bach Society of St. Louis, Coffee Cantata and Dido and Aeneas with Madison Bach Musicians, and a chorister with The Sante Fe Desert Chorale, Grammy-Nominated Ensemble True Concord, and Boston Lyric Opera. 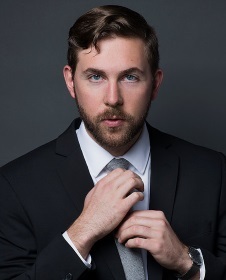 Elijah holds a Master of Music in Vocal Performance from New England Conservatory and resides in New York City.